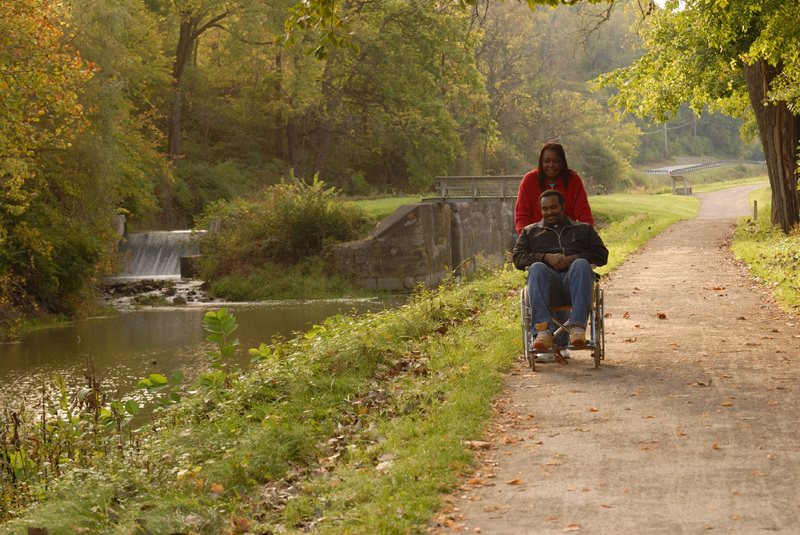 The Ohio Canal Corridor (OCC) has been working for more than two decades to develop the Ohio & Erie Canalway, a federally designated National Heritage Area, which includes Cuyahoga County's and Cleveland's 10-mile portion of the Towpath Trail. In July 2010, The Trust for Public Land acquired two long-sought after properties along the Cuyahoga River in Cleveland for the trail. The two adjacent riverside properties total more than 11 acres and include 2800 linear feet of the Towpath Trail, which will ultimately terminate at the future Canal Basin Park, a new 20-acre public park at the site where the Ohio Canal once ntered the Cuyahoga River. These properties will serve as a junction for the Towpath Trail to connect with two other branch trails: the Link to the Lake Trail, which TPL purchased for trail development in December 2009, connecting to Wendy Park on Lake Erie; and the Walworth Run Trail which intersects with Michael Zone Recreation and further along the lakefront to Edgewater Park. Funding for the purchases was secured from the Clean Ohio Fund and from Cuyahoga County's state capitol grant.